Ask SEMpdx: What are the Benefits of Attending / Speaking at Search Engine Conferences? Search Engine Guide > Todd Mintz > Ask SEMpdx: What are the Benefits of Attending / Speaking at Search Engine Conferences? Why do I attend search engine conferences? So I can document (for sales & marketing purposes) my close personal relationships with search engine representatives allowing me to show prospective clients how my exclusive insider access will generate top search engine rankings for anybody purchasing my SEM services (Note: Please do not take this seriously and if somebody else makes a similar claim, make sure not to use them as a vendor because they are scamming you). Mark Knowles: I have been to several search engine conferences in several venues and I can honestly say that I have not had one bad experience. Since you asked, there are a number of observations I have made during a conference that highlight the benefits. They come from interactions with some of the vendors, speakers, sponsors, and other attendees during the conference and evening events. Every time I go, I meet companies that are offering products and services to help with issues that our company and clients face each week. They don't always meet an immediate need but, as the market grows it is helpful to see how new products and services respond to these changes. The session speakers provide insight to the issues of the day. They are usually sharing a first person experience that illuminates a new twist or trend in the world of search. I can almost always apply something I have heard to the following work week. Here's another one, you might miss. You might not think that sitting with a table of strangers during a lunch break is a place to learn something exciting and new but, this one can be a sleeper. I have met some of the most interesting people with the most fascinating experiences at the lunch breaks. These stories spark others to join in and before you know it we aren't strangers any more. Folks are openly sharing questions and answers with the group to real life search challenges. I learn, I contribute, and I swap a business card from time to time. If you are reading this, then you are probably part of a pretty small group of folks, the folks of search. You should network, because you never know when you are going to need an expert hand. That hand may be sitting across from you at a round table in a conference hall during a lunch break. OK, now the parties. Google, Microsoft, and Yahoo really know how to put one on. You probably just need to come see for yourself before I start rattling off a list of goodies. The most enjoyable part is the networking and free flowing information exchange at these networking events. You look around the room and realize these are the folks that are helping the internet move forward. I say, get your VISA card, book a flight, grab a room and register for the next search conference you can find, you won't be sorry. Attending: Depending on your level of SEM experience, the benefits of attendance may vary. The benefits for novice or intermediate professionals is tremendous, as most conferences are targeted at providing background strategies and tactics, as well as networking opportunities. For advanced professionals, the benefits are more about keeping up on the latest technology and techniques and reconnecting with peers as well as expanding the network. So it's either about insights for newbies ore validation for experts. The primary drawback is the cost of attending, and for experts, not enough learning opportunities. Speaking: Often considered the Holy Grail of building personal and corporate visibility and credibility, is typically challenging to accomplish. The speaking circuit is very competitive, so speakers must show experience or have a compelling story or technology. Once on the circuit, it's often easier to get additional engagements. Beyond the marketing opportunity, it often comes with cost benefits: complimentary attendance, and depending on the person or conference, speaker fees or honorarium. There are few drawbacks to speaking, besides the time commitment to preparing for and participating in presentations as well as the occasional disappointment from small audience turnouts. Reporting: For industry experts and gifted writers, a press pass is the ideal way to experience search conferences. In exchange for a complimentary pass, you get backstage access to presenters, exhibitors and sponsors. The drawback, of course, is that you have to be credentialed and actually write about the event, which takes work and discipline. Once you've demonstrated credibility as a reporter, the resulting coverage has a potential for much greater visibility for the writer (and their company) than speaking without the pressure to perform in front of a group. It´s sort of ironic how social functions like conferences can be so important for an industry that implicitly relies on the web. But they are important - I´d go so far as to say essential - for several reasons. On the attendance side, there are educational benefits from the sessions. There´s usually a diverse selection of speakers on a panel, so you can hear from the in-house SEO, the agency, and the search engine rep on the same topic. You should always introduce yourself to speakers you liked, and ask them a question or two. This can be a great way to pick up some advice from people actively doing search marketing, and it´s also great for networking. For speakers, there´s huge potential for signing on new clients and creating buzz for their company or consultancy. The simple reason: credibility. If someone´s speaking at SES, Pubcon, or SMX, chances are they know what they´re doing (if they don´t, they won´t be invited back). But the absolute best part of attending search conferences is the networking. This crushes the online social networking experience. Have you ever tried to email someone in the industry to get on their radar? Or maybe you´ve written blog posts specifically to target influential folks? There´s so much more power doing it in person. You´re far more likely to strike up a relationship at these kinds of events, simply because people like talking to other people! Especially us geeky search marketer types who spend too much time online. And then there´s the jewels of wisdom you can pick up over a few drinks with fellow search marketers… which brings me to another side benefit of attendance, and that´s the free beer! Colleen Wright: I just started Response Interactive LLC last January. Prior to starting my company, I worked in corporate marketing where I focused on all aspects of marketing campaigns both online and offline. The types of conferences I would go to during my time in corporate marketing focused on the broader picture. Even though I think I know a lot, I always come away with new tidbits of information that will help improve my campaigns. I get a chance to connect with new people and re-connect with people I haven't seen in a while. I learn about new and existing products and services available to streamline my processes and increase the success for my clients. The other reason I like attending several conferences a year is because I train people on how to leverage the Internet to increase sales through the Search Engine Academy of Oregon. Attending these conferences helps me stay current with the latest and greatest information that industry pundits are willing to share. I can then share this new information with my students. Educational. Yes, I've been doing search for a long time. Yes, I know quite a bit. No, I don't know everything, nor do I get an opportunity to work with every type of business content or web site. So, I do attend sessions that I feel I'll learn the most from. I don't always walk away learning much in the way of specific strategies or tactics anymore, but the sessions do tend to spark ideas for applying other's experiences & expertise to my company's clients. So, perhaps the benefit isn't educational as much as it is brainstorming. Immersing yourself in the environment for a couple of days and thinking & talking about a lot of search marketing helps to bring about or solidify ideas, processes, services, etc. Networking. There's nothing like a SES conference to put you in the same room with your peers. Even though we're usually & technically competitors, I've found this to be one of the most beneficial aspects of conference participation. There's nothing like being able to rely on a network of peers for questions, ideas, brainstorming and referrals. Sales & Presentation. I don't attend or present conferences with the intention of getting a sale. But as I mentioned above under “networking”, conferences give you an opportunity to make connections and get referrals. Additionally, the intangible benefits of associating yourself and your company with conferences helps to establish your credibility with potential clients. In addition to the sales benefits I spoke about above, speaking at conferences gives you the opportunity to polish your presentation skills including thinking on your feet, connecting with an audience, and putting together a coherent presentation. These are all sales oriented skills that help me as a business owner and the primary business development & sales person. Scott Hendison: Over the years, the value of attending conferences really hasn´t changed for me, and the primary benefit has always been education and networking. Without attending, I could only get that type of education by devoting endless hours to reading articles, blogs, and forums. After that, I'd still need to consider the sources, and sort theory from fact all day long. I'm never going to get a better education in a shorter amount of time than by immersing my in a conference and taking notes about every new fact I hear. As far as networking goes, from the very first one I attended, I began meeting great people all over the country. Each trip, I develop new friendships, and usually, new business relationships. Speaking at the most recent Pubcon did open a few doors to people I may not otherwise have met, too. Obviously, the number one benefit of attending search engine marketing conferences is that smug satisfaction you experience when Google, Yahoo, and MSN reveal the inner workings of their ranking algorithms to all attendees. Oh … and, the free pens that light-up and change colors. OK. The real benefit is the ability to gain direct insight into the latest techniques and developments all aspects of search engine promotion. Not to mention, rubbing elbows and exchanging ideas with some of the world's most important search-related decision makers and service providers. In addition, for me, experiencing the delivery of new concepts and inspirational presentations in person, truly sparks the imagination so much more than reading white papers or sitting in on Webinars. The after parties are a pretty good benefit, as well. Lisa Williams: I´ve been attending search conferences since 2001 and reasons for attending have evolved over the years. Initially, it was with the intention of learning the search landscape and to define where it fit into my business. Then it was to keep on top of search marketing trends and interact with the engines. Now it´s also a way to meet potential new clients and grow my business. Since search marketing has become an integral part of the marketing mix, search conferences have become an important part of search education for marketers and business execs. Whether you´re starting your career as a search marketer or starting your search education, commit to attending a search conference such as SMX or Search Engine Strategies. Once you´ve decided to attend a search conference, decide on your goal for the conference-meet 5 potential new clients, learn 5 new search search tactics or join a search marketing organization. Admission to the shows can cost upwards of $3000, but what you´ll take away in education and new business relationships is worth the price of admission. Ask SEMpdx: "What is the best way for a Newbie to learn Search Engine Marketing? You think that impresses me? I was invited to Sergey and Larry's weddings last year! Hehe ok, seriously, that picture was definitely good for a laugh, though it's a bit of a search industry insider joke. Excellent post! Have you yourself gotten any new clients from speaking at the conferences, Todd? How about the others who chimed in? Yes, networking is one of the main benefits of attending conferences! 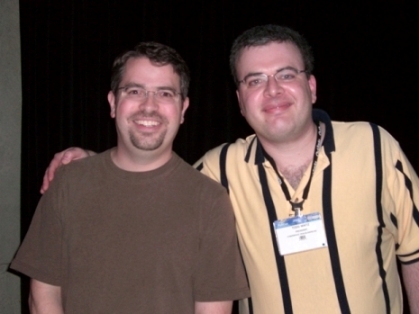 In fact, it was great meeting you and several of the other contributors to this article at PubCon 2007. 1. After attending a conference, I feel re-energized about what I do every day and re-committed to my profession. 2. I can often find validation for theories among the panelists and attendees, which sends me home with new confidence in what I know. 3. Those of us who labor away from the centers of commerce (I live in the mountains of Colorado) need to connect with our peers in person once in while - meet the people behind the emails, if you will. 4. I've also found that in person, it's easy to become friends with people who are competitors online. This can unexpectly open a lot of doors. I have just completed reading the article and comments. I am new to this industry, but have to fully agree with the idea that presenations, speaking, interaction and education are the key elements we are all looking for at these industry sessions. What I find most important for me is that I can talk to the several of the most relevant experts with little effort. I would not call this education as much as expert interaction and innovation. The notion of ideation is key when I am looking for solutions, customers or just learn about this industry, and these experts provide this insight and discussion for me. The sessions that find the most compelling to attend are the two day seminar style sessions. Quick to get into and easy on budget.